Justin Bieber turns 23 today and to celebrate the occasion, we are taking a look back over his impressive career so far. First solo artist to have three No.1 albums before the age of 18 (US). Justin claimed three chart-topping US albums before reaching his 18th birthday: My World 2.0 debuted at No.1 on 10 April 2010 with first-week sales of 283,000, Never Say Never: The Remixes made its chart-topping debut on 5 March 2011 with sales of 165,000, and Under the Mistletoe, the first Christmas album by a male artist to debut at No.1 in the 55-year history of the US albums chart, crowned the countdown on 19 November 2011 after first-week sales of 210,000. Youngest solo artist to achieve five No.1 US albums. Before his 19th birthday, he had hit No.1 with My World 2.0 (2010), Never Say Never: The Remixes (2011), Under the Mistletoe (2011), Believe (2012) and Believe Acoustic (2013). Most streamed track on Spotify in one week; “What do you mean?” song. The release of the song What Do You Mean? saw Justin adopt a new, more mature sound that proved a hit beyond his already massive fan base. On the online music service Spotify, it was streamed an amazing 30,723,708 times between 28 August and 3 September 2015. First act to occupy all top three positions simultaneously on the UK singles chart. Justin has also found remarkable success in the UK, with his records Love Yourself (No.1), Sorry (No.2) and What Do You Mean? (No.3) all topping the singles chart on January 14, 2016. Most “disliked” video online. “Baby” music video. While the Ontario-born singer’s rise to pop super stardom has been extraordinary, his music hasn’t been without its critics. Released in 2010, Baby still stands as the most disliked video online, with 6,531,515 non-Beliebers giving it a thumbs-down on YouTube as of 25 July 2016. Most Nickelodeon’s Kids’ Choice Awards won by a male singer. Most followers on Instagram for a male musician. No other male musician has more followers on Instagram than Justin Bieber, with a total of 77,901,663 fans on the photo network as of 23 August 2016. This means that Bieber is also the most followed male on Instagram and the seventh most followed person on the platform overall. Most followers on Twitter (male). Most subscribers for a musician on YouTube (male). Most viewed music channel on YouTube; JustinBieberVevo (individual). What Justin Bieber Wants for His 23rd Birthday?? 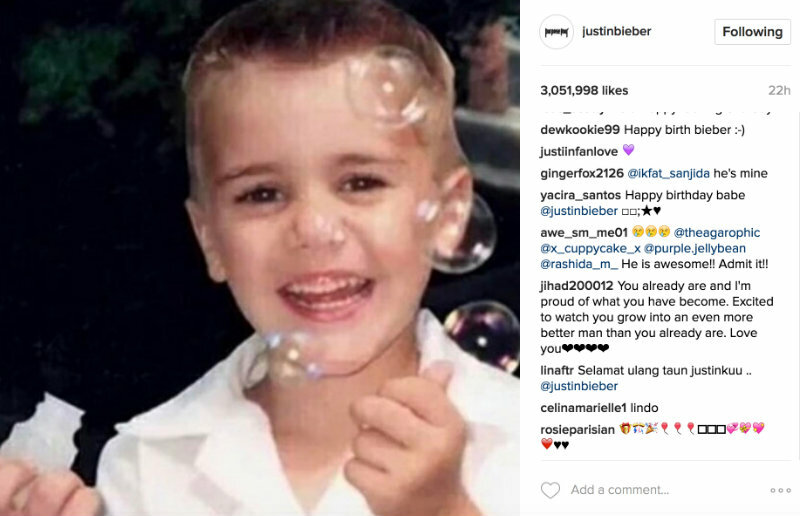 In honor of his 23rd birthday on Wednesday, March 1, Justin Bieber took to Instagram to share his biggest wish with his 79 million followers. “It’s my birthday and all I want is to be a better friend, better brother, better son and better man,” he captioned a childhood photo of himself smiling and blowing bubbles. A source tells Us Weekly that Justin boarded a private jet on Wednesday for a birthday getaway. In the hours leading up to his big day, the birthday boy revealed that he’s back in the recording studio and working on new music. “Making beats in my studio,” he captioned a video of a midtempo electronic track playing in an all-white room filled with various instruments, speakers and flashing hue lights. In a second, captionless clip, he played around with a keyboard and a bongo over the same looped beat. i love you justin i am your best fan ever to you i love you soon day one. 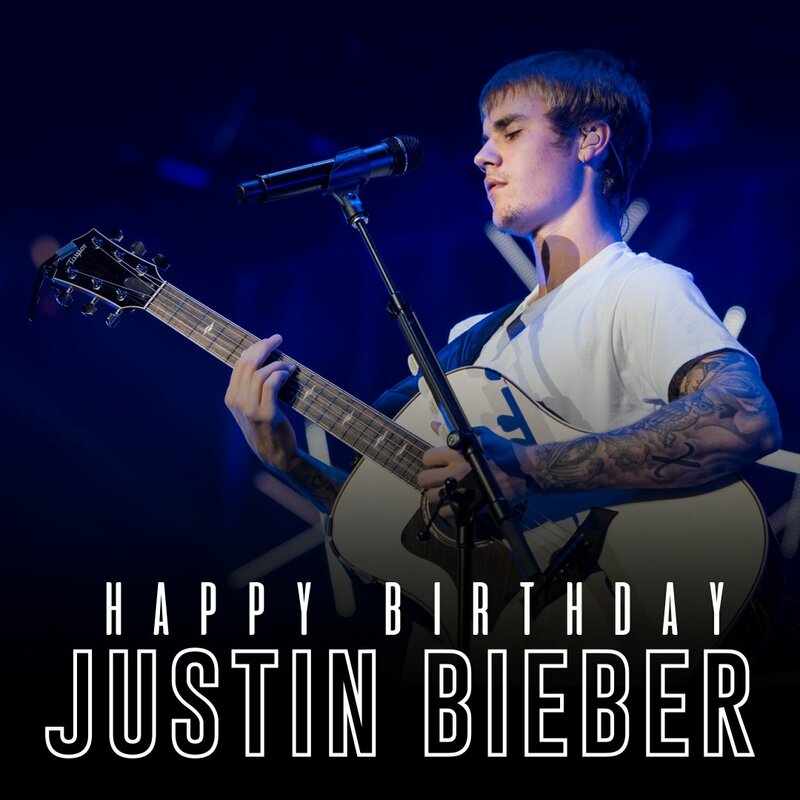 Happy birthday justin…we always love you from your belieber shiela….